Life's issues have been on the dark side the past two months. My mom will be released from rehab in 10 days. Even though she is physically healthy-ish, she is mentally blank. Very pleasant but blank. My father is even sadder, retreating more and more into himself and his world. What has lifted my spirits is the welcomed pregnancy of my niece Jennifer. That there is a birth balances out other current events. As I did the math for this quilt - the design was created by Jacquie Gering of Tallgrass Prairie Studio and used with her permission - I found myself getting lost in the process and in the color decisions. I loved seeing this come together. And almost best of all, I loved doing the quilting. There is something so soothing about laying in rows and rows of stitches. That textural payoff is well worth it. Jacquie calls this quilt "Outside In." There was a shower for Jen in NYC on Saturday, January 19. We have had Book of Mormon tickets for Sunday, January 20, in Chicago for 18 months. I told Paula I really couldn't go and worked hard not only on this baby quilt but also on the diaper bag/tote which serves at the quilt wrapping. (This tote is great - it's zippered, has a zippered compartment on the outside, two generous inside pockets - Jinny Beyer fabric). I figured I would get them in the mail by the 12th. But wait! I remembered that John and I have flight vouchers for Southwest Airlines because we missed our December trip to Charleston, South Carolina, and these miles expire in February. So the perfect solution: go to Manhattan for the day. And so I did. Yesterday I left Midway at 8:30, got to LaGuardia at 11:30, shower in midtown at 1, and returned to LaGuardia for a flight at 7. John was at Midway and I was home by 9:30 last night? Gosh, does this make me a jet setter? It was good to be at my niece's shower. Focusing on Jen and Tim and their little Baby P balances out the events at the other end of life's spectrum. Perhaps I'll listen to the Lion King soundtrack and "The Circle of Life" as we drive downtown for Book of Mormon. I wish I could take credit for this quilt, but I'm just the courier. 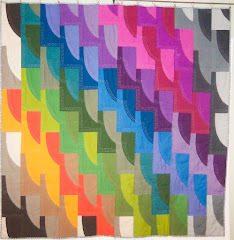 The seven blocks of this quilt were submitted to the Modern Quilt Guild as part of the QuiltCon Block Challenge. 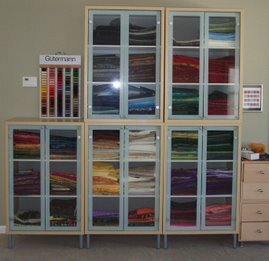 The Modern Quilt Guild's goal is to put a quilt on every bed of the Austin Children's Shelter - Austin is where the Modern Quilt Guild is holding its first convention in February 2013. These 7 blocks were sent to the Chicago Modern Quilt Guild for our donation quilt to the shelter. Thanks to a clever layout by Iris Johnson and even cleverer execution of this layout by CMQG Program Chair Sarah Shulman, Debbie Bookman, and Debbie Pine, this top (and look at the wonderful backing), this quilt is ready for quilting. 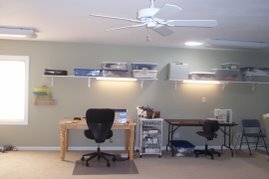 The top and backing have travelled 50 miles from Vernon Hills to Lemont, the home of T and F Quilting Studio and Terri Karls. It's good to find time to sew. A year ago I was setting blogging goals for the year, and I have followed as some of my blogger friends have assessed their year's work and set goals for the new year. With all that has happened, I am thrilled to find any time to sew. Setting and assessing goals isn't for me right now. My mom is slowly rehabbing at Plymouth Place, a mile away. 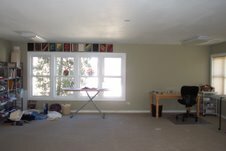 So it's easy to pop in for meals or therapy sessions. The background of this picture is the back of a baby quilt for my NYC niece Jen. Her shower is January 19, and I'll blog about this quilt then. Meanwhile, it does provide a nice backdrop for some improvisational and foundation-pieced blocks, preparation for the January CMQG meeting!